Hop on in the time bubble and take a trip with me back to the simpler time of 2002. A year when comics only cost a nickle and families gathered around the new fangled picture boxes to watch the Twilight Zone. This is a time when anything was possible and dreams were as big as the moon. 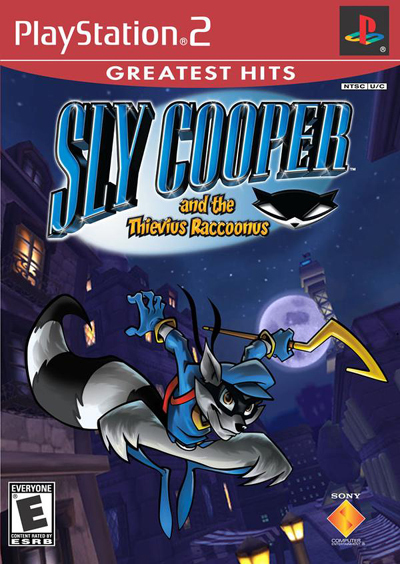 This, my friends, was the world in which Sly Cooper and the Thevius Raccoonus was released. Ok, maybe 2002 wasn't like that, but it was a while ago. Sly Cooper was the first PS2 Sucker Punch game and boy it was a great one. Even by today's standards the graphics are clean and the cartoony style of the characters work perfectly. I had a hard time not thinking that it looked like a Wii game while I was playing it. It's almost a cell shading technique except all the thick black lines are on the character, not surrounding them. All the environments are interesting and varied. Each world provides a different type of experience visually and really makes the game stand out. The controls are pretty basic for a platformer. One button is the attack button, another is jump, and another is interact. It works very well and as you gain new abilities, the interact button does a lot. From flipping a switch to jumping on a rope to walk across, the Circle button becomes one of the most used buttons outside of jump. Each world has a hub that you run around and enter other levels from. And each level has it's share of collectables which also gives you new powers if you can manage to find all the clues. It really is worthwhile to hunt them down since some of the new abilities save your life, like being able to jump out of water or survive a fall into a bottomless pit. And while most of the new moves aren't utilized much, the ones that are control so well that I don't think I ever had a problem where it was the game's fault that I died. And that's a big plus. There is a fair amount of story as well. All the cutscenes are in this very cool stylized animation and flesh out the characters around Sly as well as the villians they're going up against. My favorite aspect of the presentation of the story is how every world is opened with a great 1950s "Sly Cooper in:" title card that fit the mood of the game perfectly. Carmelita the fox is Sly's main nemesis as she tries to arrest him throughout even though they never actually fight each other. It's a really cool cat and mouse type story within the bigger story of trying to retrieve the Thevius Raccoonus. Sly Cooper is a game that I'm shocked I missed the first time around. It's essentially a bigger and better Crash Bandicoot and I absolutely loved Crash back in the PS1 days. But Sly Cooper is also very much it's own game with the stealth mechanics and varied level variety. If you also missed Sly and have the means to play it (either an actual PS2 or a PS3 with BC still), then you owe it to yourself to hunt it down. I think it cost me $5 on eBay. I love this game.